Competition now closed! This was the end result. Thank you to everyone who entered. I am on the look-out for Male and Female 'natural' make-up fanatics to appear in a magazine feature, alongside myself! This will be a before/after piece therefore the ideal applicant will have a skin concern of their own (this could be acne, redness, rosacea, vitiligo, scarring, dry skin, dehydrated skin, tiered skin, large bags, sparse brows - anything at all!!) 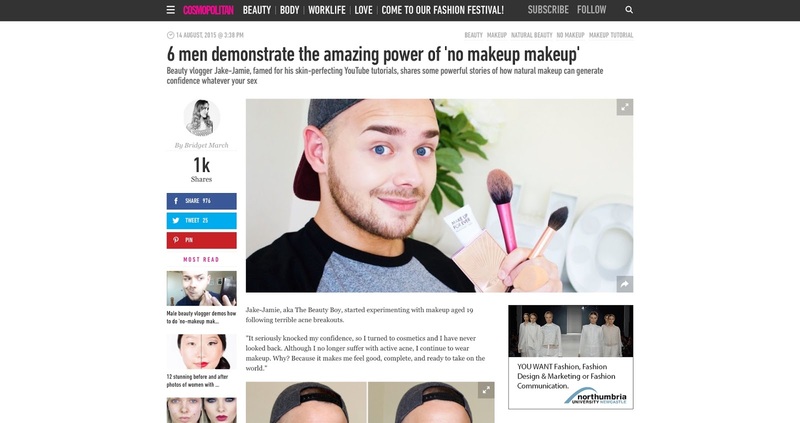 - as the article will be aimed at showing the power of 'natural' make-up, and how you can transform your face in the most natural way possible! I want you to take all the tips and tricks that you have learnt through watching my channel and apply that to your entry! Please make sure all pictures are taken against a white/neutral background, the higher the image quality - the more chance you have of appearing in the feature. The aim is to cover your skin concern, without looking like you are wearing any make-up at all! Allowing your natural beauty to shine through! You're before/after should have the same format as mine below, please send your before/after as two individual images - do not join them together. These picture's should not be photoshopped, and no filters should be used. The best entry will also win a Charlotte Tilbury Magic Foundation, in the shade of your choice. *Please note, this foundation is not released for general sale until September 2015. Therefore you will receive your prize, a couple of days after its official release. Email your entries to makeupbyjakejamie@gmail.com, if you could include details of your 'skin concern' and how make up gives you confidence that would be fab! Now, lets show everybody that we all have the canvas and we all deserve to look and feel incredible! The winners will be featured in the national press, therefore by entering this competition you are agreeing to your name and photographs provided being used for consumer magazines, online consumer websites, and broadcast opportunities. The best entry will also win a Charlotte Tilbury Magic Foundation, in the shade of your choice. Please note, this foundation is not released for general sale until September 2015. Therefore you will receive your prize, a couple of days after its official release. The competition will run from July 31st - 12th August 2015 (the "Closing Date") Any entries received after this date will not be eligible. The winner of 'Magic Foundation' will be selected by 14th August and will be notified via email. In the event that contact cannot be made with the winner after 3 attempts, we shall select another winner. There is no cash prize, and I reserve the right to substitute any prize with a prize of equivalent value in the event of circumstances outside of its control. The winner's name will be available upon request upon writing to The Beauty Boy. Our decision is final and no correspondence on any matter concerning the contest will be entered into. We reserve the right to suspend or termniate the contest or to extend any closing date.